Our SDPI look back is almost complete. Just two more conferences to go. This week, we'll tackle the MAC, a conference that has been stuck on 13 teams for five seasons with the addition of Temple in 2007. Just when it looked like they would have an even number for 2012 with the addition of Massachusetts, Temple bolts to the Big East. To see last year's MAC SDPI post, click here. This first paragraph will explain how SDPI is calculated. So if you want the meat of this article skip on down. In the 2011 MAC regular season, conference play only, championship game excluded, the average MAC team gained and allowed 3217.385 yards. The standard deviation for yards gained (offense) was 658.88 yards. The standard deviation for yards allowed (defense) was 493.54 yards. Ohio gained 3713 yards and allowed 2971 yards. Their offensive SDPI was 0.75 = [(3713-3217.385)/658.88]. Their defensive SDPI was 0.50 = [(3217.385-2971)/493.54]. Their total SDPI was 1.25. This number ranked 3rd in the MAC. 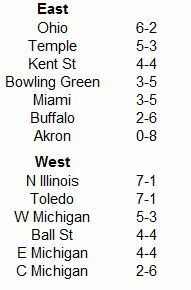 Here are the 2011 MAC standings. Now here are the 2011 MAC SDPI standings. The standings are sorted by division, by total SDPI with ranking for each category (out of 13 teams) in parentheses. Ohio won the MAC East for the third time in seven seasons under Frank Solich, but failed yet again in their attempt to win the conference for the first time since 1968. Instead, Northern Illinois was your league champion, following up an 8-0 regular season with a 7-1 campaign and a second consecutive appearance in the MAC Championship Game. Miami of Ohio followed up their MAC championship with a middling 3-5 conference record. After riding a close game hot streak (5-0 in one-score league games) to (relative) glory in 2010, their luck regressed and the Redhawks managed just a 1-3 mark in one-score MAC games in 2011. Couple that with the fact that they were forced to play three of the conferences top-four teams (Toledo, Ohio, and Temple) on the road, and the Redhawks record is just a tad misleading. 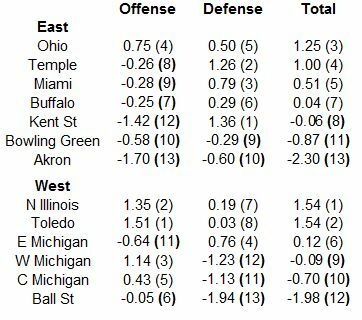 For good measure, they also faced three BCS conference foes (Cincinnati, Minnesota, and Missouri) outside the MAC, further depressing their overall mark. After enjoying success at the IAA level at Lehigh and Elon, Pete Lembo guided Ball State to their first non-losing season (and a win over Indiana) since 2008 in his maiden voyage with the Cardinals. Unfortunately, much of that success may not be immediately sustainable in the near-term. The Cardinals won each of their four conference games by four points or less (combined margin of 12 points). In one of their league losses, they fell by 42. Over their eight MAC games, Ball State was outscored by 60 points. Teams with a similar scoring margin only win about a quarter of their games instead of half. Don't be surprised if the Cardinals are not able to Lembo quite as well in 2012. After being held to 305 yards in their MAC opener against Temple, the Rockets blasted off, never gaining fewer than 456 yards over the rest of the conference season. Their best performance came when they obliterated Western Michigan to the tune of 804 yards and 66 points in an exciting mid-week game. Zips is their nickname and the number of touchdowns their offense scored in three league games (zero touchdowns versus Temple, Miami, and Kent State). The Golden Flashes held six of their eight MAC opponents below 400 yards. Unfortunately, their offense was nearly as weak as their defense was strong. This was especially true when the Golden Flashes lost a game during which they allowed 166 total yards! Six league opponents gained at least 500 yards against the Cardinals, and their last seven league opponents averaged 545 yards against them! Central Michigan had a pretty good run under quarterback Dan LeFevour. With the dual-threat quarterback (or Rust Belt Tim Tebow if you prefer), the Chippewas went 27-4 against the rest of the MAC from 2006-2009, won three MAC titles, two bowl games, and culminated his senior campaign with a 12-2 season and AP top-25 finish. However, since LeFevour matriculated, the wins have been much harder to come by. The Chippewas have gone just 4-12 against the rest of the MAC and have put head coach Dan Enos squarely on the hot seat. Certainly, the offense has declined without the stud under center, falling from first in offensive SDPI in 2009 to fifth in both 2010 and 2011. However, the offense, while weakened has still been above average both seasons. The real culprit has been the disappearance of the defense. 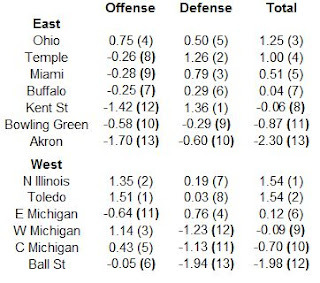 When the Chippewas were rolling through the MAC unbeaten in 2009, the defense ranked second in SDPI. The past two seasons, which have seen a pair of 2-6 league finishes, the Chippewas have finished 10th and 11th (out of 13 teams) in defensive SDPI. Digging a little deeper, the decline has been the primary result of a pass defense that has gone from very good to atrocious. 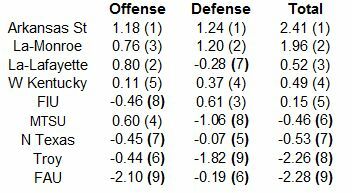 The following table lists the passing numbers put up by MAC teams when facing the Central Michigan defense the past three seasons. In 2009, the Chippewas allowed only seven passing touchdowns all season and just over six yards per pass attempt. In the next two seasons, they allowed 30 touchdown passes (against just eight interceptions) while allowing over seven and then over eight yards per pass attempt. If Central Michigan has designs on returning to the top of the MAC, they needn't find the next Dan LeFevour, but they must find a way to corral opposing receivers. Continuing on our mid-major tour, this week we examine the youngest Division IA conference, the Sun Belt. To see last year's SDPI recap of the Sun Belt, click here. This first paragraph will explain how SDPI is calculated. So if you want the meat of this article skip on down. In the 2011 Sun Belt regular season, conference play only, the average Sun Belt team gained and allowed 3030.667 yards. The standard deviation for yards gained (offense) was 454.44 yards. The standard deviation for yards allowed (defense) was 415.54 yards. Western Kentucky gained 3081 yards and allowed 2875 yards. Their offensive SDPI was 0.11 = [(3081-3030.667)/454.44]. Their defensive SDPI was 0.37 = [(3030.667-2875)/415.54]. Their total SDPI was 0.49. This number ranked 4th in the Sun Belt. Here are the 2011 Sun Belt standings. 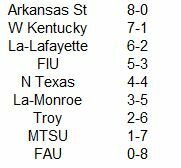 Now here are the 2011 Sun Belt SDPI standings. The standings are sorted by total SDPI with ranking for each category (out of 9 teams) in parentheses. 2011 marked the first time since 2005 that Troy did not win at least a share of the Sun Belt championship. The Trojans lost six conference games in 2012, exceeding the number they lost from 2006-2010 (five losses). In their stead, Arkansas State won their second Sun Belt title and first outright conference title since winning the Southland and finishing undefeated in 1975. Rising up and joining the Red Wolves near the top of the league standings were the Hilltoppers from Western Kentucky. The IA neophytes finished 7-1 in Sun Belt play after winning just two conference games in their first two years in the league. Louisiana-Monroe has finished with an above-average SDPI rating in each of the past three seasons. However, their conference record over those three seasons is just 12-12. Statistically, 2011 was the Warhawks best season. However, they were 0-3 in one-score games within the conference. Couple that with a non-league schedule that included trips to Florida State, TCU, and Iowa and you have the makings of a 4-8 disappointment. Western Kentucky was a solid Sun Belt team in 2011, but their statistical makeup was not that of a team with a robust 7-1 league record. The Hilltoppers were a little lucky in one-score games, posting a 3-1 mark in conference play. 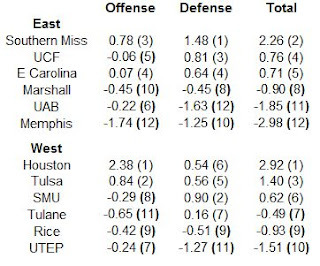 No Sun Belt team drastically exceeded their statistical peripherals in 2011. Hugh Freeze became Arkansas State's offensive coordinator in 2010 and he raised their offense from dead last in the Sun Belt to third. As the head coach in 2011, the offense continued to improve and ranked first in the league. The Owls sent Howard Schnellenberger out with a winless conference season. The Owls were held below 300 yards five times in their eight league games. To complement their ferocious offense, the Red Wolves also boasted the league's best defense. No Sun Belt team gained more than 373 yards against them. The offense was below average in 2011, but the defensive ineptitude was the primary reason Troy plummeted in the conference standings. Four Sun Belt teams gained over 500 yards against the Trojans, and two others came very close (Arkansas State and Western Kentucky gained 489 and 494 yards respectively). Western Kentucky enjoyed by far their most successful season in 2011 since joining the Sun Belt as a full-time member in 2009. While the Hilltoppers rise in the standings was a total team effort, I wanted to recognize the play of their underrated star running back Bobby Rainey. Rainey did not play much as a redshirt freshman in 2008 when the Hilltoppers were provisional Sun Belt members. However, he earned the starting job early in his sophomore season and maintained a vice grip on it until his eligibility expired. The table below lists Rainey's rushing performance against Sun Belt teams for the past three seasons. Rainey rushed for over 3100 yards since 2009 in conference play only! The Hilltoppers have played 24 league games since 2009, so his per game average is a very robust 131 yards per game. He topped the 100-yard plateau 16 times in 24 games, including 13 times in the past two seasons! He had some especially huge games in 2011, gaining 200 yards on the ground three times in league play! While Rainey was not an especially valuable receiver out of the backfield, he improved his catches and yardage each season. Here are his Sun Belt only receiving numbers since 2009. Rainey also threw a touchdown against Arkansas State this season, meaning he accounted for 31 touchdowns versus Sun Belt foes since 2009 (26 rushing, four receiving, and one passing). As a team, the Hilltoppers scored 77 total offensive touchdowns against Sun belt foes since 2009. Thus, Rainey has accounted for over 40% (40.26 to be exact) of his team's total offensive touchdowns since joining the Sun Belt! Rainey went undrafted in the recently completed 2012 NFL Draft and is currently on the Baltimore Ravens roster. While he faces relatively long odds at making a profound impact in professional football, his performance at Western Kentucky was one worthy of praise from the hill tops. This week we give the preeminent mid-major conference the SDPI treatment. The Mountain West has only been in existence since 1999, but already it has promoted two schools (TCU and Utah) to the 'big leagues' with a third (Boise State) to follow after the 2012 season is complete. For 2012, the conference will add three additional teams to replace the departing Horned Frogs (Fresno State, Hawaii, and Nevada). All three are consistent bowl teams, but will have their work cut out for them to unseat Boise State at the top. To see last year's post on the Mountain West, click here. This first paragraph will explain how SDPI is calculated. So if you want the meat of this article skip on down. In the 2011 Mountain West regular season, conference play only, the average Mountain West team gained and allowed 2692.375 yards. The standard deviation for yards gained (offense) was 624.30 yards. The standard deviation for yards allowed (defense) was 342.69 yards. Air Force gained 3002 yards and allowed 2531 yards. Their offensive SDPI was 0.50 = [(3002-2692.375)/624.30]. Their defensive SDPI was 0.47 = [(2692.375-2531)/342.69]. Their total SDPI was 0.97. This number ranked 3rd in the Mountain West. Here are the 2011 Mountain West standings. Now here are the 2011 Mountain West SDPI standings. The standings are sorted by total SDPI with ranking for each category (out of 8 teams) in parentheses. TCU defeated Boise State by a single point in mid-November to decide the Mountain West championship. The win likely cost the Broncos a shot at the national championship. Perhaps not surprisingly, TCU and Boise rated as the best teams in terms of SDPI in the Mountain West by a significant margin. They were also extremely close, with the Broncos edging the Horned Frogs by just .03 standard deviations. If this blog were CNN, the race between those teams would be too close to call. In the aforementioned TCU/Boise clash, the Horned Frogs inflicted just the third defeat on a Boise State team quarterbacked by Kellen Moore, one of the best college players of recent memory. In fact, the Horned Frogs can take great pride in beating Moore twice. Perhaps the most amazing fact about Moore's career is that his three total losses came by a combined five points. His Broncos lost to the Horned Frogs twice (by a point each time) and to Nevada in 2010 in overtime by three points. While Moore was quarterback of the Broncos, no team outscored them by more than a single point in regulation. Genuflect dear readers on true greatness! Air Force pounded the dregs of the conference, beating Colorado State, New Mexico, and UNLV by a combined 94 points. Unfortunately, the Falcons could not break through and beat any of the league's stronger teams, losing to Boise State, TCU, and San Diego State by a combined 41 points (not a terrible margin considering the competition). The Falcons also failed to beat Wyoming, falling at home by eight points. The Falcons had the misfortune of playing extremely well against teams they were much better than and playing not as well against teams they were either on equal footing with or moderately worse than. Consequently, they ended up with a losing conference record despite solid peripherals. The Wyoming Cowboys did one thing extremely well in 2011. Unfortunately, the thing they did well is more a result of random chance than anything within their control. The Cowboys managed a flawless 5-0 record in one-score games in 2011 (3-0 within the conference). I suppose I was a bit premature in declaring the Cowboys only did one thing well. They also forced a ton of turnovers, leading the conference with 19 forced in their seven league games. This proclivity at forcing turnovers led to a league-leading +10 turnover margin in conference play and helped propel the Cowboys to five wins in the conference. The Broncos started conference play with a bang, rolling up 742 yards against Colorado State. They never returned to that lofty stratosphere, but they did manage to gain at least 416 yards in every remaining conference game. The good news for the Lobos is that they didn't finish ninth in the Mountain West like they did in 2010. The bad news is there were only eight teams in the Mountain West in 2011. After being torched by the future Hesiman winner in the season opener, the Horned Frogs rebounded to post the best defense in the Mountain West for the fourth year in a row. To be fair, outside of their evisceration at the hands of Boise State (allowed 742 yards), the Rams were relatively average on defense. They allowed 395 yards per game in their other six conference games. If they had posted an average defensive performance against the Broncos, they would have finished a respectable fifth on defense in the Mountain West. The TCU Horned Frogs play their first ever Big 12 game on September 15th at Kansas. They will enter that contest with a rather impressive 24-game conference winning streak. The last time TCU lost a conference game was November 6, 2008 at Utah. The Horned Frogs lost that game 13-10, and the Utes wound up finishing the year unbeaten and ranked number two in the AP Poll. Had the Horned Frogs won that game, they would currently be riding a 33-game conference winning streak. Unfortunately, that game happened and the Horned Frogs have to be content with 24 in a row. How impressive is this in regards to recent history? To answer that question I looked at every conference win streak since the beginning of the BCS era (1998). There have been six instances (in addition to TCU's current active streak) of teams winning at least 20 conference games in a row since 1998. They are in chronological order: Florida State 24 games (1998-2001), Miami 27 games (1999-2003), Boise State 31 games (2001-2005), Southern Cal 27 games (2003-2006), Ohio State 20 games (2005-2007), and Boise State 22 games (2008-2010). To determine the relative 'impressiveness' of each streak, I calculated each team's average points scored and allowed in the streak, the number of close games they played (those decided by eight points or less), and the number of above-average teams they beat in the streak. I defined above-average as having an SRS score of greater than 0. The SRS, or Simple Rating System is a quick and dirty rating method utilized by College Football Reference that takes into account margin of victory and strength of schedule. The table below lists the merits of the seven streaks of at least 20 wins and also includes the team that ended the streak. As the table makes clear, while Boise (first edition) does own the longest streak at 31 games, only about a quarter of their wins came against teams that would be classified as above-average. Continuing on the schedule angle, while Southern Cal has the smallest scoring margin of the seven teams and played in the most close games during the streak, they also faced an amazing 22 above-average opponents in their 27 games. Finally, Ohio State has the distinction of being the only one of these 'Magnificent Seven' to have their conference win streak ended on their home field. Compared to the other teams on this list, TCU appears to be a notch below the BCS conference schools, but based on point differential and schedule strength, is probably the most impressive of the mid-majors. After giving all six BCS conferences the SDPI treatment, we not turn our attention to the little guys. We'll begin with Conference USA, a league that nearly sent a team to a BCS bowl for the first time ever. To see last year's SDPI post on Conference USA, click here. This first paragraph will explain how SDPI is calculated. So if you want the meat of this article skip on down. In the 2011 CUSA regular season, conference play only, championship game excluded, the average CUSA team gained and allowed 3241.25 yards. The standard deviation for yards gained (offense) was 746.63 yards. The standard deviation for yards allowed (defense) was 441.29 yards. Rice gained 2926 yards and allowed 3467 yards. Their offensive SDPI was -0.42 = [(2926-3241.25)/746.63]. Their defensive SDPI was -0.51 = [(3241.25-3467)/441.29]. Their total SDPI was -0.93. This number ranked 9th in Conference USA. Here are the 2011 CUSA standings. Now here are the 2011 CUSA SDPI standings. The standings are sorted by division by total SDPI with ranking for each category (out of 12 teams) in parentheses. Houston boasted the first undefeated regular season in Conference USA since Tulane in 1998. Unfortunately for the Cougars, things went horribly awry in the Conference USA Championship Game (on their home field no less!). While the conference missed out on having their first ever BCS bowl game participant, the league did finish with two teams ranked in the top 25 (Southern Miss and Houston) for the second straight year after going five seasons without a single league member finishing the season ranked in the top 25. Perhaps the most ringing endorsement of the league in 2011 was that the head coaches of both championship game participants got jobs in BCS conferences (Texas A&M and North Carolina). The Knights from Central Florida followed up the best season in school history with a subpar 5-7 record. However, six of their seven losses game came by a touchdown or less, including a two-point loss at eventual champ Southern Miss. The Knights have been one of the premiere programs in the league since joining in 2005, so I don't think George O'Leary should start updating his resume just yet. The preeminent MAC program of the late-90's and early 2000's struggled upon entering Conference USA. 2011 marked the first season Marshall finished with a winning conference record since joining the league in 2005. Unfortunately, the (immediate) results may not be sustainable. Marshall was a perfect 5-0 in one-score games. While that in and of itself does not damn the Thundering Herd, it should also be noted that despite posting a winning record on the year, Marshall was actually outgained by 88 points over 13 games. A market correction of sorts is likely in store for 2012. The Cougars gained at least 500 yards in each conference game, topped 600 yards five times, and 700 yards twice. Then in the biggest game of the season, they gained only 428 yards as they were upset by Southern Miss. This marks two seasons in a row the Tigers have featured the worst offense in the conference. The Tigers were held below 200 yards in three of their eight conference games. Southern Miss was rarely dominant defensively (held only one conference opponent below 200 yards), but were consistently strong (just two conference opponents gained over 400 yards). Five of their eights conference opponent topped 500 yards against the Blazers. Six of their eights opponents also scored 30 or more on the Blazers moribund defense. 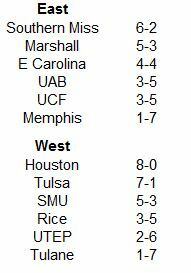 Since Conference USA adopted a divisional format in 2005, its fair to say a balance of power has been established. Central Florida, East Carolina, or Southern Miss have won the East division each season. Meanwhile, in the West, Houston, SMU, or Tulsa has claimed each division title. Between those six teams, they have posted a winning record in the conference 29 times since 2005. The other six teams, Marshall, Memphis, and UAB in the East, and Rice, Tulane, and UTEP in the West, have posted six combined winning conference records between them in that same span. In fact, those six teams have had just one winning conference record in the past three seasons (Marshall's 5-3 mark in 2011). The top three teams in each division also rarely lose to those in the bottom three. The table below lists the combined records of the East Power Three (Central Florida, East Carolina, and Southern Miss) versus the East Bottom Three (Marshall, Memphis, and UAB) and the West Power Three (Houston, SMU, and Tulsa) versus the West Bottom Three (Rice, Tulane, and UTEP). The East and West Power Three have both posted sterling marks against the East and West Bottom Three. Both sets of power triumvirates have won more than 70% of their games against the bottom teams. SMU has fared the worst among both sets of power trios by going just 11-10 against the dregs of the West. However, it should be noted that the Mustangs went winless in conference play for two consecutive seasons (2007 and 2008). In the other five seasons, they have gone a robust 11-4 versus Rice, Tulane, and UTEP. 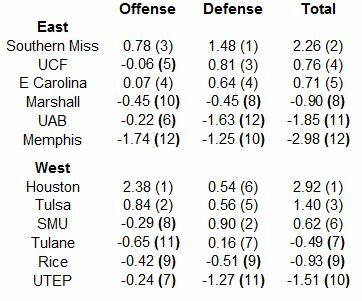 Regression by Marshall and improvement by Central Florida and East Carolina should maintain that balance of power in the East. Meanwhile, in the West, SMU and Tulsa should be the dominant teams, resigning Rice, Tulane, and UTEP to second-division status once again.